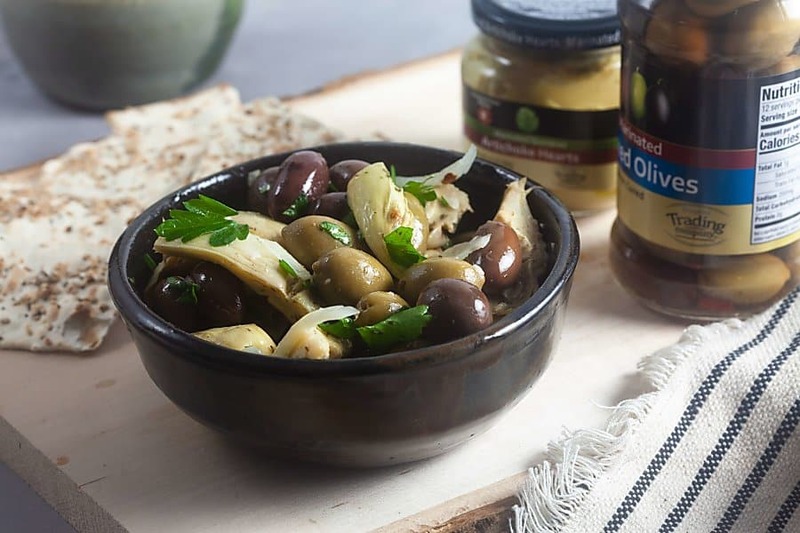 Marinated Artichoke and Olive Appetizer | Healthy. Delicious. 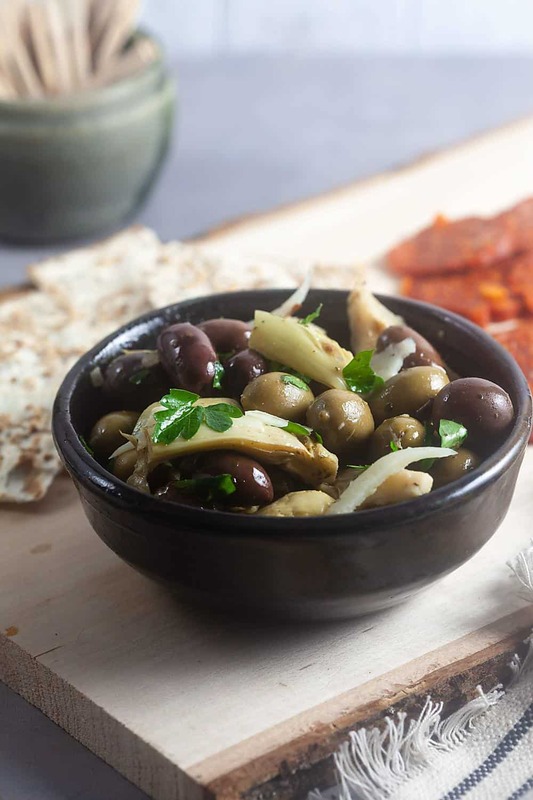 This simple marinated artichoke and olive appetizer is full of bright, Spanish-inspired flavors. It makes a great addition to a holiday cheese board or a tapas-style spread. It’s also a great little snack any time! This post has been sponsored by ShopRite Supermarkets. All thoughts and opinions are my own. When Shawn and I were in DC earlier this summer, we walked passed one of my favorite Spanish restaurants while we were looking for a place to sit down and eat lunch in between museums. We ended up going for noodles instead, but I haven’t been able to shake my craving for tapas ever since. There’s only one Spanish restaurant that I know of here in Albany and they only do tapas on their bar menu. So, I finally took matters into my own hands and made a tapas-inspired spread for dinner one night. We had air fried patatas bravas, devils on horseback, sliced chorizo, and, my favorite of the night, this simple artichoke, olive, and Manchego salad. I headed to ShopRite Supermarket for ingredients because they always have a really good selection of international products at affordable prices. I knew I’d be able to find the Manchego cheese that I wanted there. It also gave me the opportunity to check out their new ShopRite Trading Company products. 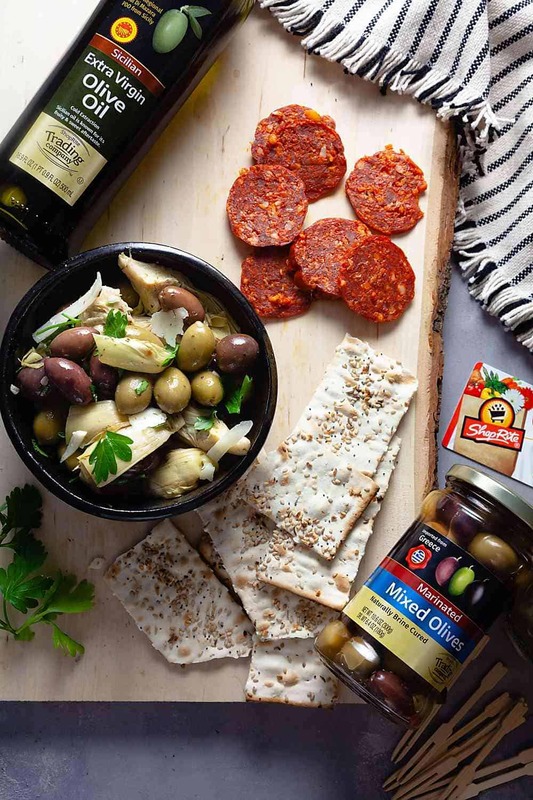 ShopRite Trading Company launched earlier this year and features artisanal products inspired by Asian, Indian, Greek, and Latin cuisines, which are imported from Italy, Ecuador, Spain, Greece, and more! I love experimenting with cuisines from other cultures, so I was really excited to give these products a whirl. 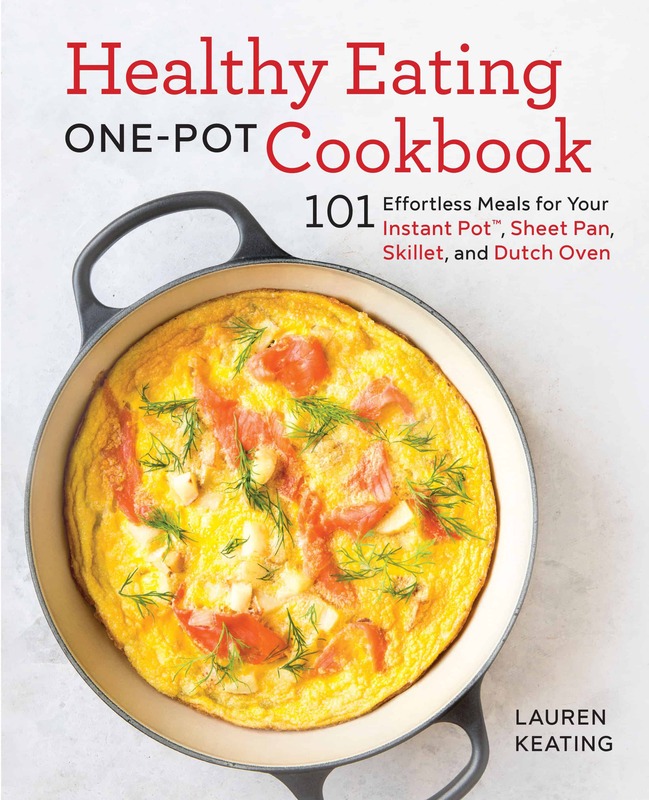 They have everything from olive oils to cooking sauces to marinated artichoke hearts. 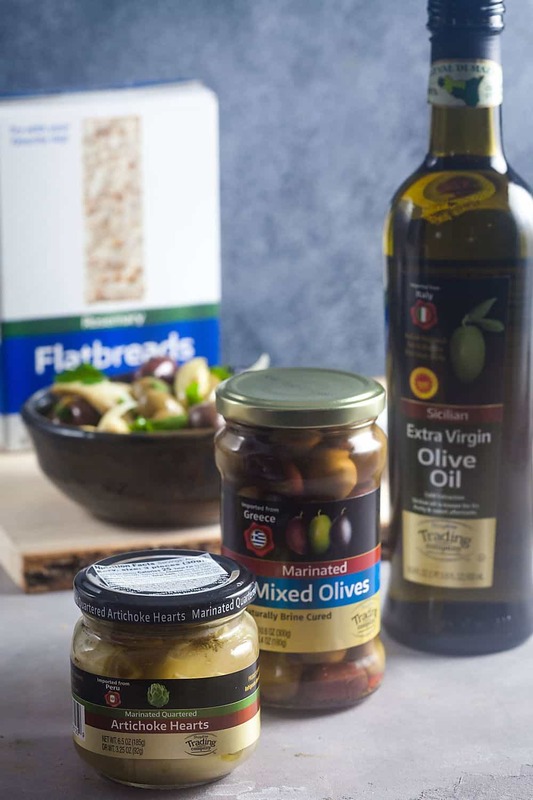 You can find them in almost every aisle of ShopRite Supermarket – look for the black ShopRite Trading Company logo on the bottom right corner of the label. For this tapas-style artichoke and olive salad, I used ShopRite Trading Company Imported from Greece Marinated Mixed Olives, STC Imported from Peru Marinated Artichoke Hearts Quarteredquartered marinated artichoke hearts imported from Peru, and STC Imported Italian Extra Virgin Olive Val Di Marza PDO from Sicilyextra virgin olive oil from Sicily. I also grabbed a box of STC Rosemary Flatbreads to serve with the olives. To make the salad, I made a simple marinade by heating a little olive oil with garlic and lemon zest. This infuses the oil with flavor and makes a really delicious base for your dish. I threw in a few red pepper flakes for heat and a splash of sherry vinegar for acidity. I poured the marinade over the drained artichokes and olives, then added in some shaved Manchego cheese and fresh parsley. 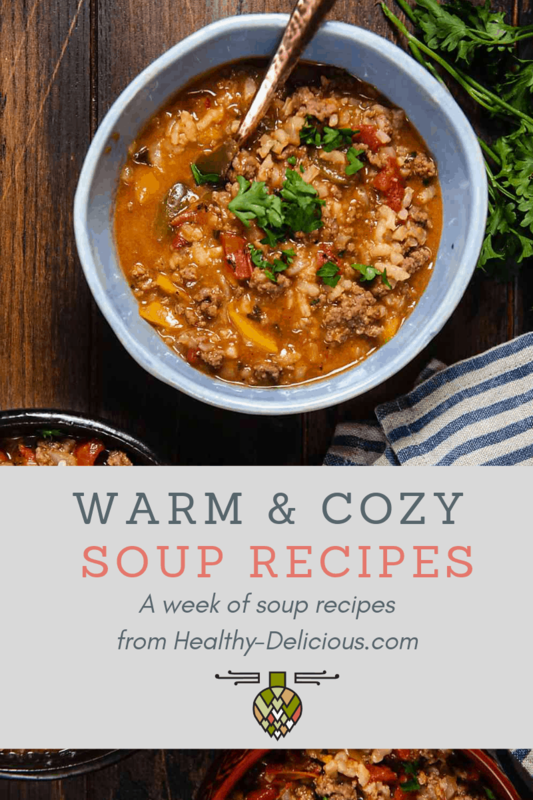 You can eat this appetizer right away – it’s delicious when the oil is still a little warm – or serve it at room temperature. The oil solidifies when it’s refrigerated, so if you want to make it ahead of time, be sure to pull it out of the fridge about an hour before you want to eat to let it come up to room temperature. Add the olive oil to a small pot set over medium heat. When the oil starts to shimmer, add the garlic and lemon zest. Cook 2-3 minutes or until the garlic begins to turn golden. Immediately remove the pot from the heat and stir in the pepper flakes and vinegar. 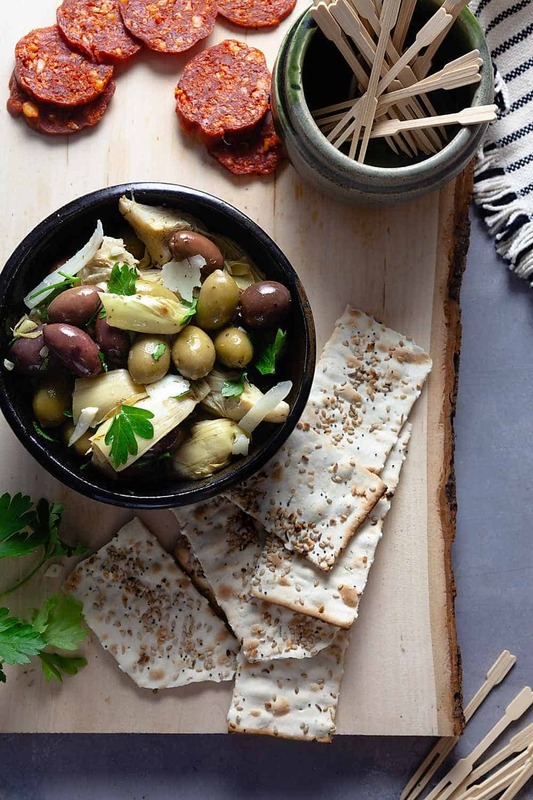 In a medium bowl, combine the artichoke quarters and olives. Pour the oil mixture over the salad and mix well. Gently stir in the Manchego and parsley. The marinated mixed olives have pits. You can use an olive/cherry pitter to remove them before making this recipe or be sure to have a bowl/napkin available for your guests to discard their pits into. This sounds delicious and all, but I fail to see how you would eat it with crackers? especially if the olives contain pits. I add the crackers to the board to eat along with the olive mix, but I don’t actually put the mix on the cracker, if that makes sense.